Friday, July 8, 2016, 7:30 p.m.
Saturday, July 9, 2016, 7:30 p.m.
Sunday, July 10, 2016, 2:30 p.m. The original musical lampoon of American politics! One of the longest-running Broadway shows of the 1930’s, and the first musical to win the Pulitzer Prize for Drama! 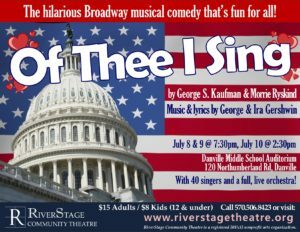 Just in time for the 2016 elections, RiverStage presents the classic all-American musical satire Of Thee I Sing the weekend of July 8-10 at Danville Middle School in Danville! All seating is general admission, regular tickets are $15, and tickets for children age 12 and under are just $8, with group discounts available. 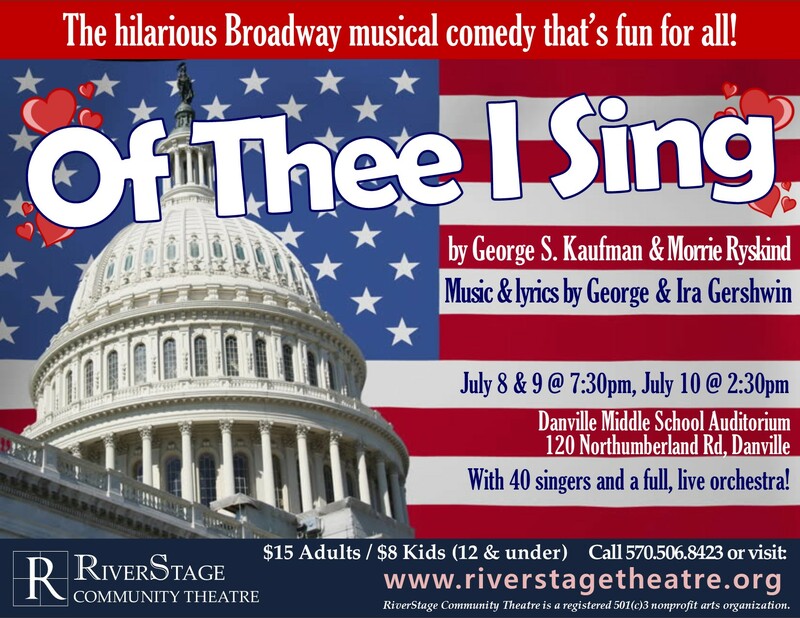 Of Thee I Sing by the comedy-writing duo George S. Kaufman and Morrie Ryskind (Animal Crackers, A Night at the Opera), with music and lyrics by Ira and George Gershwin (Porgy and Bess, Strike Up the Band), is the original musical satire of American politics. The story focuses on the election campaign of John P. Wintergreen who, lacking any new ideas, runs on the platform that “Love Is Sweeping the Country” and promises that if elected, he will marry the winner of an Atlantic City beauty pageant. Trouble begins when he falls in love with Mary Turner (the campaign secretary) instead of Diana Devereaux (the Southern belle who wins the pageant). With politicians getting skewered left and right (including a Vice President who wanders the White House unrecognized by his own staff), Of Thee I Sing is a hilarious and timeless send-up of presidential elections and politics that is as funny and relevant today as ever. The show features a large cast of 40 actors, singers and dancers who have appeared in productions with RiverStage, Valley Players, Christ Wesleyan Church, Shippensburg University, National Historic Theatre, and many others. The show will be performed with a full, live orchestra, featuring some of George Gershwin’s greatest tunes including “Love Is Sweeping the Country,” “Of Thee I Sing,” and “Posterity Is Just Around the Corner.” It’s All-American fun for Americans of all ages!